Tim Van Doren likes to grow things. There's never a shortage of crops from his personal garden each summer, and there's always some herbs growing on his windowsill. He even grew a summer job into a rewarding career he loves. Tim grew up in Mauston, Wisconsin. His mom was a teacher who waited tables at a Wisconsin Dells pizza joint during her summers off, and one summer Tim decided to tag along and bus tables. "When I was 16 I went into the kitchen making pizzas and loved it," says Tim, "and after a few summers I'd work any station on the line. After not finding a career path at UW-Madison, I turned back to what I really enjoyed and decided I would do this professionally." Now a culinary graduate from MATC, Tim has logged more than 16 years in the industry. 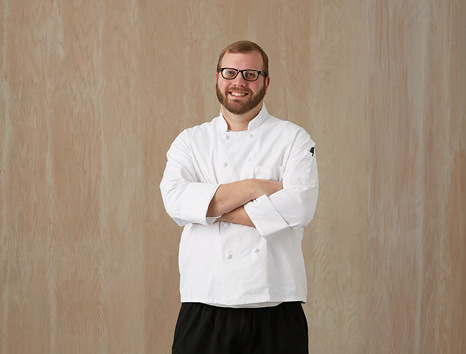 After cooking in hotels, bars and grills, a stint as head chef at former Madison landmark The Blue Marlin, and even helping a friend in a food cart just for fun-Tim made his Food Fight debut as a sous chef at Johnny Delmonico's, where today he is Chef de Cuisine. So what does he enjoy most about restaurant life? "The food-whether it's fancy or family, it never gets old to me," says Tim. "And the camaraderie-no matter how stressful it may be sometimes, people will always have your back once you earn their trust. There's something so enjoyable about being part of a team that makes customers happy, and I love being able to do that with whatever I serve." Tim adds that Food Fight has made his career as a chef even more rewarding: "We're always continuously improving, whether it's new menus at old restaurants or new spaces opening up. The hustle and bustle in this company never stops. (Management will) listen to and address concerns from all their employees...and the large variety of restaurants to dine out at isn't bad, either." Despite the hustle and bustle, Tim finds plenty of time for personal pursuits. "I'm really into canning and preserving things I grow from my garden: tomatoes, hot sauce, sauerkraut, pickles, salsas, pickled jalapeños, etc. Otherwise I like to play disc golf, hunt, fish, cheer on the Pack, hang out with family, or just stay in with a good jigsaw puzzle, game, or TV series."